This is the pic. of Shanta Ben, the Grandma mentioned above. 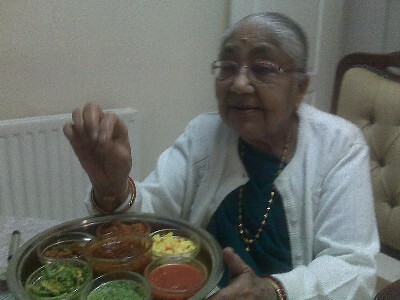 Let us quickly share how we met this lady, the proud mother of Nitin Mehta. Mr. Mehta has made a name for himself in the United Kingdom with his intense work in the field of Vegetarianism. He is quite popular and has made many friends who frequently visit them. They stay in a lovely house at East Croydon, UK. The first thing that catches your eye as you enter his driveway is an old white Amabassador car which they shipped from India to UK. It is like a magnificent welcome to their cozy home. Mr. Nitin Mehta started an organization called The Young Indian Vegetarians of UK. They are a group of people committed to the cause of vegetarianism and a healthy way of life. Their website is comprehensive, featuring many writings by Mehtaji and even a newsletter dating back to August 1983, encouraging comments by many popular organizations. 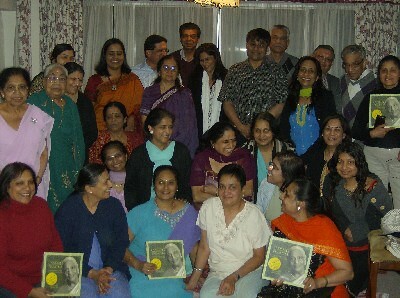 On April 18th this year, Mr. Mehta invited us to his home where we were to address this group about our vegetarian cookbook “Cooking at Home with Pedatha” since it had won the Gourmand award of ‘Best Vegetarian Cookbook in the world, 2006’. But before the talk, we were to dine with his family. As we entered his home with Dr. Prakash Kalmadi (whose Ayurvedic insights form the basis of our next book), we were ushered into the dining room where the first thing that our eyes fell on was a delicious spread of pickles on the dining table. 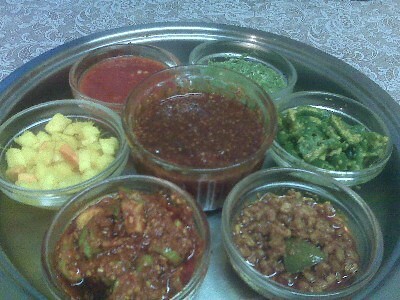 We were instantly excited since it was an all Gujarati spread. The next attention grabber was Shanta Ben who stood there with such a warm smile! It was like meeting Pedatha all over again. We sat down for dinner, a lovely meal made by Mr. Mehta’s wife, Pratibha Ben. Dhoklas, Gujarati dal, soft rotis, sweet dish – what a regional fare to discover in a foreign land! The pickles were amazing and we found ourselves asking the ladies for the recipes. Shanta Ben took a while to realize that we were serious about wanting the recipes of the GUJARATI PICKLES in detail, but once in the groove, she excitedly reeled them off. Those were fun moments as Shanta Ben reeled off the recipes the traditional way and Pratibha Ben kept adding her inputs on how to them user friendly and contemporary. The guests began to arrive soon after, so we got just 3 recipes which we would love to share out here. 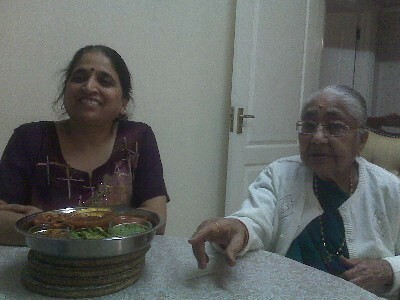 Shanta Ben experienced such joy at sharing the recipes that she was beaming even hours later. She may not understand English in depth as she would her mother tongue, but she was attentive throughout our talk. Perhaps we had struck the language of love as we spoke about our book and the importance of striking a chord with our elders. She stayed awake till we left, blessing us many times. Simple joys that make a difference! The idea is not just to document traditional recipes, but to enjoy moments of sharing and caring, to convey to our elders that they are special because they are such a storehouse of knowledge and love. We must say that back home, for many of us, home meals have become so cosmopolitan and contemporary, that we can hardly call them meals of the region we belong to. But at the Mehta home that evening, we had to remind ourselves that we were indeed in UK and not in the heart of Gujarat! Wash and pat dry 15-20 thick green chillies. Remove the stalks and slit each chilli length-wise. Remove the seeds unless you enjoy the spice. Add 1 tablespoon Split Mustard (Rai Naa Koraya), a pinch of turmeric, a pinch of asafetida, salt to taste and 2 teaspoons oil to the chillies. Squeeze juice of half a lemon to the above and shake well. Let the pickle mature for a day; can be refrigerated and kept for a week or two. Wash and pat dry 15-20 Tindodas. Cut them into thin strips (approx. 8 per veggie). Add 1 teaspoon chilli powder, ¼ teaspoon turmeric powder, a pinch of asafetida, salt to taste and 2 teaspoons oil. Add 3 teaspoon Achaar Masala (also known as Sambhar, this is not the south Indian sambhar made with lentils), readily available in Indian stores. Can be eaten instantly; stays good for weeks in the refrigerator. Wash and pat dry 3-4 raw mangoes. Chop, add ¼ cup of salt and leave overnight. Next day, drain off the excess water and let the mangoes dry for an hour. Don’t dry them much longer as they will lose the crunch. Now, wash and soak 2 cups of fenugreek seeds for a couple of hours. Strain and dry on a cloth for 1-2 hours. Heat 1 cup of hot oil. Pour ½ cup of hot oil on the fenugreek. Add 2 teaspoons chilli powder, ¼ teaspoon turmeric powder and salt to taste. 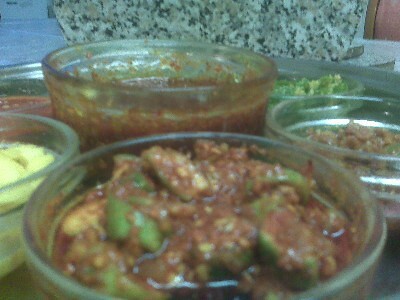 Add the chopped mangoes to the fenugreek pickle. Add the remaining oil and shake well. Let the pickle mature for another day. Stays good for 3-4 months in the refrigerator. Hope you enjoyed these recipes. Click to read many more heartwarming tributes and recipes. Share a few lines about your favourite family recipe in the comment form below. The joy of documenting tribute recipes is an experience in itself. It connects generations.